16/03/2018 Three new historical road signs added to Weddington Village Today page, scroll to bottom of page and they are the last 3. 12/02/2018 Postcard images of St Johns Ambulance Brigade Nurses at the Castle in 1916 added to Weddington Castle as a Red Cross Hospital ​gallery. 28/11/2017 3 images of sale deeds for a parcel of Estate land dated 1929 added to Weddington Castle & Grounds Gallery. Two images of Weddington Parish Hall in 1953 added. 13/11/2017 Letter header from 'an unsophisticated Jock' added to Weddington Castle as a Red Cross Hospital ​gallery. 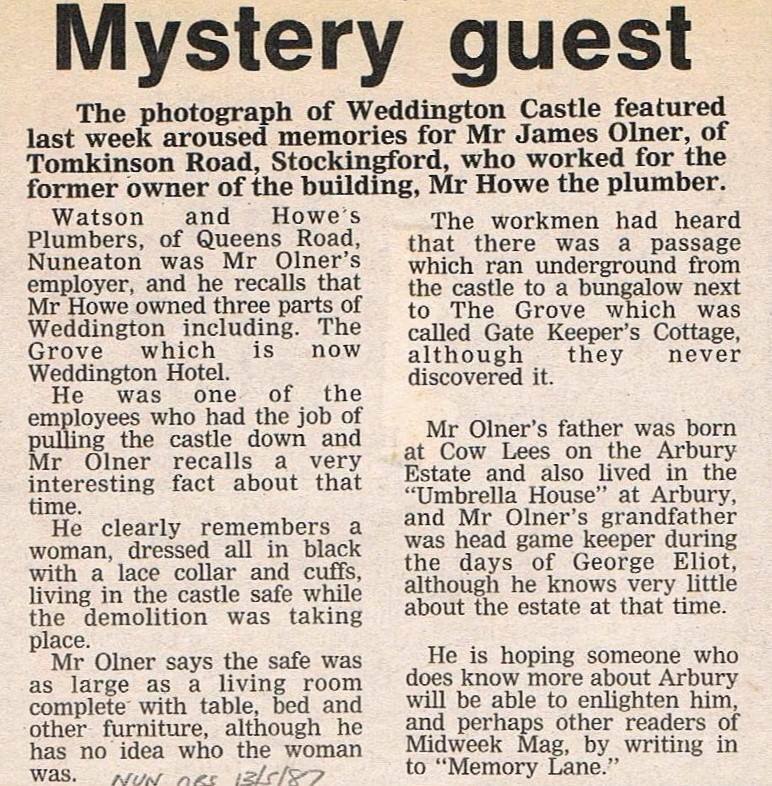 18/10/2017 ​Article on 'Mystery Guest' (possibly Mrs Shawe?) seen at the Castle from Midweek Mag published in 1987​ added to Miscellanea section. 2017 photo of Castle Road added to Weddington Village Today ​gallery. 19/09/2017 Plan of original depopulated Weddington Village added. 11/08/2017 Newspaper article on demolition of the Castle added to Weddington Castle Gallery. 4 new images of maps of the Castle plus info on a bottle cellar added to Weddington Castle Gallery​. 10/08/2017 Image of the Knox family of The Chase added to Local Halls page and old plan of Castle Estate grounds added to Picture Gallery. 29/07/2017 1993 image of St James Church added to Gallery. 16/07/2017 Image of Tuttle Hill Windmill from 1993 added to Local Halls page. 13/07/2017 Picture of 1995 bowling tournament added to The Grove gallery. 12/07/2017 Image of Church fete from 1960s added to Weddington Village gallery. 10/07/2017 Page on The Briars added to Local Halls page. 11/06/2017 Photo of Weddington Walk added to Weddington Village page. 10/06/2017 Photo of train passing Weddington fields in the early 1960s added to Weddington Village page. 15/05/2017 'Key People' page for Alan F Cook updated with online links to his two published historic/contemporary novellas set in and around Weddington. 12/05/2017 Two new photographs of soldiers at Weddington Castle as a Red Cross Hospital added. 02/05/2017 Three photos of Astley Castle stable block added to 'Other Locals Halls' section. Photo of 1923 wedding of Mabel Taylor added, Mabel was a former nurse at Weddington Castle Red Cross Hospital. 01/05/2017 'Nuneaton Girl' a drawing from an autograph book kept by a volunteer nurse containing letters, poems and drawings by soldiers at both Arbury and Weddington Red Cross Hospital added to Weddington Castle as a Red Cross Hospital ​page. 28/04/2017 Two new photographs of Weddington Castle as a Red Cross Hospital added. 25/02/2017 3 new photos of Weddington Castle as a Red Cross Hospital added, including a 1916 trenches reenactment in the grounds. Map showing 'Wedington' in the 1720s added to Weddington Village gallery. 1843 Auction catalogue cover added to Weddington Castle gallery. 23/02/2017 4 new photos of Weddington Castle as a Red Cross Hospital added, 4 new images of Weddington Castle added, 2 new images of Weddington Farm added to Weddington Village gallery. 02/02/2017 Photo of interior of St James Church in 1987 added to St James Church gallery. 28/12/2016 A re-touched coloured photo of wounded soldiers convalescing at the WW1 Red Cross Hospital at Weddington in the picturesque grounds of the Castle added to Weddington Castle as a Red Cross Hospital (1916-1918) gallery. 26/12/2016 Article on The Bilstone Gibbet from The Leicester Chronicle added to Local Halls page, plus three new images of the Gibbet. 24/12/2016 Article on Childhood Memories of Weddington written by Jill Morrow, and previously published in the Nuneaton Local History Group's 'Nuneaton Historian' newsletter added: Weddington Childhood Memories. Three new photos added to Caldecote Hall page (Two of Joseph Hansom, who invented the Hansom Cab whilst staying there, and one of former owner Dempster Heming's gravestone), along with article on life of Dempster Heming. One new photo of Mr Knox and family in the grounds of The Chase added. 14/12/2016 One new image of Tuttle Hill Windmill and one new image of Camp Hill Hall added. 12/12/2016 Twelve new images added to Weddington Castle as a Red Cross Hospital (1916-1918) gallery. 02/09/2016 Five new images added to Weddington Castle gallery; two of the Castle c1925, one of the ice house, one watercolour and a photo of horse outside stableblock. One photo of Weddington Farm at harvest time added to Weddington Village gallery. 16/06/2016 Four new images added to Weddington Castle as a Red Cross Hospital (1916-1918) gallery. 06/06/2016 Nine new images added to Weddington Castle as a Red Cross Hospital (1916-1918) gallery. New 'Key People' page added for Mrs Margaret Fowler OBE, Commandant of Weddington Castle during its time as a Red Cross hospital during World War 1. 05/06/2016 A new picture gallery added: Weddington Castle as a Red Cross Hospital (1916-1918). This features recently discovered images of the Castle interior at this time. It is hoped that further images and documents will be added in the coming weeks and months. 04/06/2016 Two multiview postcards featuring images of Weddington Castle added to gallery. Four new images of The Grove undergoing renovation in 2016 added. 28/05/2016 Nuneaton News article on Edward Melly added. 24/05/2016 Photo of interior of Astley Castle in 1994 added. 15/05/2016 Three new images of Weddington Village in 2016 added. 10/05/2016 Aerial view of Astley Castle and Church added. 27/04/2016 Recollection of a milk round on a Weddington Farm in the 1940s by Alan Cadman added to Weddington Village page. 3 images of old milk bottles from Weddington Farms added to Weddington Village gallery. 1913 postcard of Attleborough Hall added. 26/04/2016 Early photo of Tuttle Hill Windmill added, courtesy of Les Holmes. 4 photos added of the demolition of the original brick rail bridge on Weddington Road, when it was replaced by a steel structure. (c) Nuneaton Memories. Added to Weddington Village gallery. 3 photos added of the gathering of the harvest at Dairy Farm, Weddington. (c) Jill Morrow. Added to Weddington Village gallery. Photo of serving staff outside Merevale Hall added. 8 photos of Weddington Silver Jubilee Party. Ryde Avenue 1977 (c) Mary Ayers​. Added to Weddington Village gallery. 24/04/2016 Photo of Astley Castle in 1920s plus 2 images of 'Pageant of Astley 1951' programme added to Astley Castle. Image of St James' Church added. ​Image of Caldecote Church in 1965 added. Early photograph of Attleborough Hall added. Photos of 2012 Weddington Village Jubilee moved from Picasaweb to Google Photos. Aerial photo of Cresswell Farm, early photo of Reg Dawson (Trent Valley worker) and 2 photos of Silver Jubilee Party 1977 added to Weddington Village gallery. 4 new images of 2011 demolition of Weddington Road bridge added to Weddington Village gallery, courtesy of A. R. Demolition.